Turn-Over Ceremony. Rogelio J. Espina, Biliran Lone District Representative (Wearing white camisa de chino) leads the cutting of ribbon together with Engr. David P. Adongay Jr., District Engineer (wearing blue stripe polo shirt), Mrs. Naricres Go, Acting Mayor of the Municipality of Caibiran (wearing green polo shirt) with some councilors of the Municipality and with the School Heads during the blessing and turn-over ceremony of Information Communication Technology (ICT) High School of Eastern Biliran in Caibiran, Biliranon October 7, 2016. 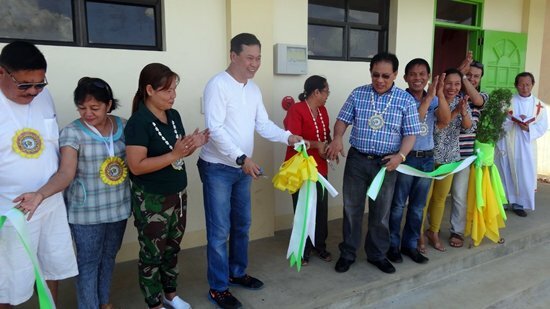 NAVAL, Biliran – Information Communication Technology (ICT) High School of Eastern Biliran in Caibiran, Biliran finally receives its first Technical Vocational and Livelihood (TVL) Workshop Building. The TVL Building was turned over on October 7, 2016 led by Rogelio J. Espina, Biliran Lone District Representative and Engr. David P. Adongay Jr., District Engineer of the Department of Public Works and Highways (DPWH) Biliran District Engineering Office (BDEO). The occasion was also graced by the presence of Engr. Alfredo L. Bollido, BDEO Chief of Maintenance Section (now OIC Assistant District Engineer), Engr. Salvador G. Regis, Chief of Construction Section and Mrs. Naricres Go, Acting Mayor of the Municipality of Caibiran with some counselors of the said Municipality. Mrs. Liezl M. Avila, HT III/ School Head of ICT High School expressed her pleasure on the completion of one-storey (TVL) Workshop Building during her acceptance message. However, Avila said that that the newly turned-over TVL Building will be temporarily occupied and divided into three TVL classes for courses: cookery, carpentry, and electrical isolation and maintenance (EIC) due to the lack of classrooms. “I hope that more classrooms will be constructed, I believe that the failure of soil test hinders the construction of the building yet we are still hopeful that the request for additional budget maybe released soon,” she appealed. ICT High school is reported to have less enrollees this school year with 250 more or less students for the K-12 program. Hence, an appeal for additional classrooms were requested to attract more students to enroll in the school. Espina, on the other hand promised to act on the clamor of the school’s request for additional school buildings. The TVL Workshop Building is a project of DPWH-BDEO in coordination with the Department of Education (DepEd) with a contract amount of P8M under CY 2016 Basic Educational Facilities Fund. The completed project will give proper educational training to senior high school students that will hone their skills in the various types of job. SHARIFF AGUAK, Maguindanao – Authorities arrested five (5) suspected drug dealers during a law enforcement operations in this town on Thursday, October 6. Police Chief Inspector Armando Liwan, Chief of Shariff Aguak Municipal Police Station identified the suspects as Macky Balubugan Dumpao, 48; Mensing Sumalay Daligdig, 18; Abo Subpian Dumpao, 20; Montero Baluno Dumpao, 18; and Tato Ali Ezong a.k.a. Cobra, 30. The suspects were captured after a five-minute firefight during the attempted serving of the search warrant around 6:45 a.m. at So. Dumpao, Timbangan, Shariff Aguak. The items seized during the operation were one small sachet containing alleged methamphetamine hydrochloride (shabu), 11 empty sachets, six pieces of disposable lighter, two digital weighing scales, one roll aluminum foil, one M16 rifle with scope and attached M203 grenade launcher, one improvised M79 grenade launcher, one magazine loaded with seven live ammunitions, one M203 grenade launcher ammunition, one M16 magazine pouch, and one grenade launcher pouch. Liwan said that joint personnel of Shariff Aguak Municipal Police Station, Provincial Public Safety Company and 19th Infantry (Commando) Battalion launched the operation by virtue of search warrants number 2016-146, 2016-143, 2016-144-and 2016-145 issued by Judge Banzawan Ibrahim, Al-Haj of Regional Trial Court (RTC) Branch13. The other subjects of the search warrant who were said to be Macky Dumpao’s cohorts in illegal drug trade were able to escape during the ensuing firefight and fled the from the scene. Meanwhile, the arrested suspects are now detained at Shariff Aguak Municipal Police Station pending the filing of charges for violation of Republic Act 9165 (Illegal Selling and Illegal Possession of Dangerous Drugs) and Republic Act 8294 (Illegal Possession of Firearms). MANILA – On the eve of the resumption of the second round of peace negotiations, the National Democratic Front of the Philippines (NDFP) expressed hopes that after 18 years, land reform and national industrialization will finally be discussed by both parties. The NDFP said that social and economic reforms, described as the “meat of the peace process,” will be the focus of the second round of peace negotiations set to take place in Oslo, Norway from October 6-10, 2016. Last month, the NDFP exchanged with the GRP a proposed “framework and outline” for the Comprehensive Agreement on Social and Economic Reforms (CASER), the second substantive item in the agenda of the peace negotiations according to the framework agreement set by The Hague Joint Declaration of 1992. “After almost two decades and two major economic crises, the 1997 Asian regional crisis and the 2008 world financial crisis, the two panels have yet to discuss a key crisis-protection agreement,” says NDFP consultant and Reciprocal Working Committee on Social and Economic Reforms (CASER) vice-chairperson Alan Jazmines. Jazmines said that the NDFP draft on social and economic reforms, which includes land reform and national industrialization as the “center of gravity” of the talks, has been prepared for discussion since 1998. “Now, we have updated our CASER draft especially in light of the worsening economic crisis brought about by neoliberal policies. However, land reform and national industrialization is still the main content of our proposal because of these twin economic development strategies’ proven resilience to the crisis of globalization,” Jazmines said. “While we expect lively and contentious discussions on CASER, we also hope that both parties are strong-willed enough to overcome differences in order to solve the armed conflict at its roots,” Echanis said. According to the NDFP proposal, the main CASER objectives are: a) carry out agrarian reform and national industrialization; b) advance the rights of exploited, oppressed, discriminated and disadvantaged sectors of society; c) uphold, protect, defend and promote economic sovereignty; and d) conserve the national patrimony and protect the environment. MAKATI CITY – The Department of Trade and Industry (DTI) Secretary Ramon Lopez emphasized the relevance of improving the country’s competitiveness, during the ceremonial contract signing on 4 October between the Philippines and the United Kingdom (UK) on a project that aims to provide technical assistance to reduce red tape in the business environment. Timely and relevant, the UK through the Asia Pacific Bilateral Programme Fund granted technical assistance to the National Competitiveness Council of the Philippines (NCC) to support the Project Repeal, an initiative inspired by the UK’s Red Tape Challenge, which addresses growing need to cut red tape across the bureaucracy. “Project Repeal, an initiative geared towards eliminating red tape by systematically removing redundant, antiquated and burdensome policies in government agencies shall facilitate us in achieving this end,” Sec. Lopez said. The trade chief also said that the UK’s assistance, which amounts to £17,969 (approximately P1.1 million) that will run until January 2017, shall capacitate Project Repeal in terms of development, pilot-testing and initial roll-out of the Standard Cost Model. The Standard Cost Model will provide a statistically valid and reliable method in estimating the regulatory burden imposed by existing regulations on businesses. The assistance will also be used to conduct a series of activities, including supplementary focus group discussions that will be held in several regions in the country to have a wider stakeholder engagement and ensure the project’s greater impact, according to NCC. Based on the Global Competitiveness Survey done before the May 9 election, the Philippines slipped 10 notches to 57th place, from 47th place. The trade chief reiterated President Rodrigo Duterte’s marching orders to improve competitiveness and the ease of doing business by reducing the processing time for business licensing and permit system. Joining Sec. Lopez in the ceremonial signing were UK Ambassador to the Philippines Asif Ahmad, DTI Assistant Secretary Arturo Boncato and Private Sector Chairman of the NCC Guillermo Luz. Construction of access roads leading to declared tourists destinations along Higatangan Circumferential Road, Higatangan Island, Naval, Biliran. As of September 30, 2016, it has an accomplishment of 90% under Chu Construction with an appropriation of P45M. 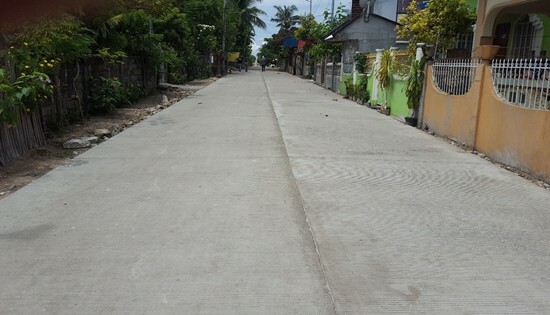 NAVAL, Biliran – Department of Public Works and Highways (DPWH) - Biliran DEO reports 90% accomplishment of its P45M Construction / Improvement of Higatangan Circumferential Road, Phase III. District Engineer, David P. Adongay Jr. said that the project is almost completed, however, the contractor has encountered a slight problem on the project that’s why it cannot be reported as 100% completed. Adongay revealed that the fund will be used for programming of road signs, loading and unloading bay or thermoplastic pavement marker as a requirement for road pavement. “I already directed BDEO Chief of Construction and Project Engineers to submit a plan as per instruction by the Construction Division Chief,” said Adongay. The Construction/ Improvement of Higatangan Circumferential Road (PHASE 3) is the final Phase of the project to complete the improvement of the entire Circumferential Road. This includes the rehabilitation of existing damaged and substandard concrete pavement, construction of concrete ditch, construction of rest rooms and installation of guardrails. Biliran DEO previously reported that Phase II of the Construction of Higatangan Circumferential Road under the CY 2015 GAA (General Appropriation Act) was already completed on December 17, 2015 with an appropriation of P40M. It includes concrete paving length of 2.20 Km (Sta.4+256.60 - Sta.6+500) under contract with B. Vicencio Construction. Meanwhile, the Construction/Improvement of 3.780 Km in Higatangan Circumferential Road (HCR) implemented by the Regional Office 8 under CY 2014 GAA was at long last already completed on May, 2016. The completion of the Improvement of Higatangan Circumferential Road will provide an access road not only for local and foreign tourists but also for the residents of the place in going to and from to the island’s tourist destinations such as the Higatangan’s popular 200-m shifting sand bar, rock formations, Marcos Hill/ Lighthouse, crystal clear waters and its fine white sands which has been declared as Tourism Development Area through Republic Act Number 10409. The said island is only a few minutes ride by small boat from Naval which is the capital town of Biliran. QUEZON CITY – While it has been a common fact that globally, investments in coal are already a downturn and energy development that is clean and renewable are now getting priority stakes in most developed countries. Companies are getting more responsible with their investments taking much precedence to the impetus of climate change, the health and environment impacts that these investments may accrue plus the increasing public transparency and reporting these investments are being required. However investments in energy development in the Philippines defy this global trend. In a country where energy market is very dynamic due to relative expansion of the economy, all streets seem to be going to energy development. But these Filipino Rich families and corporations may have lacking compared to their foreign counterparts who have earlier divested their investment from coal and other dirty and harmful energy. These families and corporations are unmindful of the global trend and are still pouring in their investments that spell death and destruction for peoples and communities. Many of these oftentimes defy Philippine laws and see environmental regulations as anathema to their profit ventures. They are unperturbed of the deaths and destruction these projects have created. Most of the Philippine Banks are into investments in coal projects. The Intergovernmental Panel on Climate Change (IPCC) unequivocally states that burning of coal is the number one greenhouse gas that causes global warming. There are many countries now, which prematurely closed down coal fired power plants in order to address the climate crisis. Besides these coal plants also face stiff resistance from host communities, environmentalist and the health sector due to its impacts on health and environment. A recent 2015 study lead by the Harvard University looking at the possible health impacts of the existing and expansion of coal plants across the Philippines, if the new coal fired power plants are allowed to operate, premature deaths may increase up to 2,410, or more than double the current number of people dying from coal-related pollution in the Philippines. To whatever degree these Philippine banks and Families invest in coal projects, the topmost banks and families are the following: Yuchengco of Rizal Commercial Banking Corporations, Henry Sy of Banco de Oro, the Ayala’s of Bank of Philippine Islands and the Gokongwei’s of JG Summit. Prior of being controversial for their involvement of an anomalous transaction and being slapped with a 1 billion-peso ($21.3 million) penalty for violations of banking rules in connection with the $81 million theft of Bangladesh Bank reserves, Rizal Commercial Banking Corp has silently etched its way in coal plant financing. The Yuchengco’s has been involved in the expansion of coal projects in the Philippines with no less than 21 coal projects they are involved with. The bank is believed to have invested not less than US $ 2.2 B in coal plant expansion. Henry Sy and its Banco de Oro many might think that diversification of its investments has made wonders for the family. But before we come to know how this family amass there nasty millions, just look how large is their investment portfolios in coal plants. To date, the Family and bank has invested around US $1.456 Trillion in coal expansion. The Ayalas are fast catching up with other rich Filipino families into “dirty” investments. Its bank, the Bank of Philippine Island based from its owned released report claimed P365.8 Billion and $425 US Million Dollar in coal plant investments. The Family also has set-up their energy company called AC Energy and is now involved in the US $1Billion drawdown of construction of the first of two identical units of 668-megawatt (MW) supercritical coal-fired power plant in Mariveles, Bataan. The Family is now a major energy conglomerate with major projects dotting the country. It own most of the plants in Bataan right now including the 135 MW in Batangas and another 135 MW in Iloilo Province. The Aboitiz family has evaded the stiff competition in Luzon and for some quite time builds its energy empire in the Southern Philippines. Its biggest project so far is the 600 MW Therma South coal plant in Toril Davao. Aboitiz also owns the Therma Luzon in Pagbilao, Quezon Province, has a 34% equity ownership of STEAG State Power, Inc. in PHIVIDEC Industrial Estate in Misamis Oriental, Northern Mindanao and owns 26.40% effective interest of the circulating fluidize-bed coal-fired power plant in Toledo, Cebu. The Gokongwei’s has also entered the arena into power development with its current thrust focused in Batangas. It is expanding its 300 MW in coal plant to 600 MW in Brgy. Pinamucan Ibaba. Completing the initial six Filipino Families investing into dirty and harmful energy is the Consunji with its company DMCI. The Family is the first to venture into coal mining and coal plant development. It owned the Calaca Coal Plant in Batangas and the notorious Semirara mines where mining accidents involving deaths of workers made it very controversial. The combined energy supply of all these coal plants accounts for 55% of the electricity needs of the country today. It is a big shift prior to the 1990’s where renewable energy was dominant. With more coal plants now in the pipeline, a total of 36 coal plants will become operational between 2016 and 2022. By 2022, coal will be occupying not less than 70% in the power mix. The fear of the country locking into coal is very certain. How will the Philippine government deal with these coal plants whose contracts will still be existing beyond 2030 and 2050, but will be forced to be shutdown due to the narrowing global emissions budget? Where will the Philippine Government get for the payment of compensation of these soon to be stranded assets? Clearly by now, the future of the Filipinos is being burned by these Filipino companies into dirty and harmful energy. 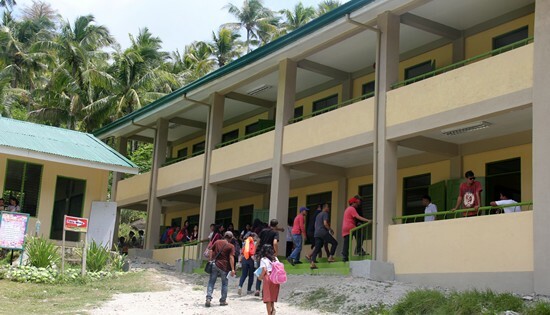 TARANGNAN, Samar – Samar First District Engineering Office (SFDEO) completes the construction of a two storey - six classroom school building in Oeste National High School. Brgy. Oeste is an island barangay of the municipality of Tarangnan, Samar which is only accessible by a one hour motorboat ride from Calbayog City. The project is implemented by SFDEO and costs some Eight million pesos from the 2015 Basic Educational Facilities Fund (BEFF). It is under contract with B. Vicencio Construction. Assistant District Engineer Loreto Cedro, head of the District’s Inspectorate Team, leads the recently held inspection of the project. School Principal Francisco Peñaranda accompanies the team during the inspection. Peñaranda said that this new building will directly benefit around 530 students who are currently enrolled in the school. He expects an influx of enrollees for the next school year from adjacent barangays. PASAY CITY – Filipinos’ artisanship and craftsmanship in modern designs remain the strength of handicraft and furniture industries, according to Department of Trade and Industry (DTI) Secretary Ramon Lopez, in his remarks during the 2nd Philippine Homestyle Congress on 23 September. During his engagement with the Philippine Chamber of Handicraft Exporters and Artisans, Inc. (PCHEAI), the Association of Handicraft Exporters (AHE) and the Chamber of Furniture Industry of the Philippines (CFIP), Sec. Lopez urged industry players to bank on the “highly-skilled, highly-trainable workforce that showcases Filipinos’ ingenuity” amidst stiffer market competition. He also assured stakeholders of handicraft and furniture industries that the government continues to spearhead initiatives to help them excel at local and international levels. The trade chief noted that both industries are dominated by micro, small and medium enterprises (MSMEs), a sector, which is a priority of President Rodrigo Duterte’s inclusive growth agenda, as well as of DTI’s Trabaho at Negosyo thrust. “We are committed to infuse an entrepreneurial mindset among MSMEs that will trigger the kind of entrepreneurship that is idea-based, demand-driven and innovation-led,” Sec. Lopez said. He outlined government initiatives, through the Philippine Trade and Investment Centers (PTICs), the Design Center of the Philippines (DCP) and the Center for International Trade Expositions and Missions (CITEM), on the handicraft industry including strengthening trade activities, technology sharing and networking with local and foreign businessmen and other design-related institutions. He also said that e-commerce through online shops is the new platform to promote MSME products. Countries with high e-commerce penetration among consumers include the UK, Germany, Korea, USA, France, UAE, Australia and Canada, where another PTIC will be opened in October. “Some of our home grown brands are even recognized as trendsetters, alongside big names in the world’s design capitals,” declared Sec. Lopez, adding that Filipinos’ innovative ideas blended well with companies’ confidence to experiment and offer something new in the market. The Design for Exports Program and the Product Specialist Programs are also initiatives that promote innovation, enhance collaboration among stakeholders, and develop new perspectives, including through coaching, knowledge sharing sessions and other activities that aim at honing skills to create products for the global market. On the furniture industry, DTI, through the Board of Investments, has assisted in capacity-building and development projects, such as the Homestyle Forward: International Trends Workshop for SMEs and Design Students, which prepares SMEs in the industry to be technically-capable in creating products attuned to international trends. Sec. Lopez also mentioned that the implementation of the roadmap for the furniture industry since 2014 has resulted to more technical assistance projects, including granting of shared service facility to specific areas, launching of information material on the industry, and initiatives on product development and design education. “We should bank on our naturally gifted workforce, composed of great talents, who are capable of staging Filipino products to the world,” Sec. Lopez concluded.